The San Diego County Sheriff's Department is getting a helping hand in its mission to keep impaired drivers off our roadways. The California Office of Traffic Safety (OTS) has awarded the Sheriff's Department a $403,000 grant that will fund a year's worth of special operations and campaigns designed to stop drivers under the influence of alcohol and drugs. "The Sheriff's Department is proud to partner with the California Office of Traffic Safety as we continue to protect our communities from impaired drivers," said Sheriff Bill Gore. DUI checkpoints, patrols and distracted driving/traffic enforcement will all be funded by the grant. 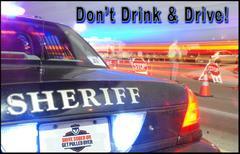 The goal is to reduce DUI-related crashes and deaths in San Diego County. So far in 2018, nearly 1,000 people have been arrested for DUI by Sheriff's Deputies. In 2017, deputies arrested 1,225 people for impaired driving. Impaired driving doesn't just mean alcohol. It can include marijuana and prescription drug use. Funding for this program was provided by a grant from the California Office of Traffic Safety (OTS), through the National Highway Traffic Safety Administration (NHTSA).